After fast-fashion brands made a successful soft landing in Korea’s fashion market years ago, the wardrobes of young or even middle-aged Koreans have been filled with low-cost garments from such brands. 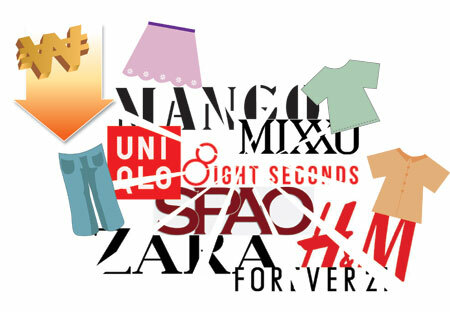 For years, big name fast-fashion chains, such as Uniqlo, Zara, H&M, 8 seconds and SPAO have beaten other brands including Levi’s or Calvin Klein Jeans, the so-called must-have items that Korean youngsters had to have in the early 2000s. With the loyalty of fans, the top three SPAs in the Korean market ― Uniqlo, Zara and H&M ― are enjoying huge success with their sales growing sharply. SPA stands for specialty store retailer of private label apparel. According to the Financial Supervisory Service’s Data Analysis, Retrieval and Transfer System, the size of the country’s SPA market remained at some 1 trillion won ($915.3 million) in 2008, but it will likely surpass the 3 trillion won threshold next year. Sales for the top three stood at some 800 billion won in 2012, growing more than 40 percent from a year earlier. 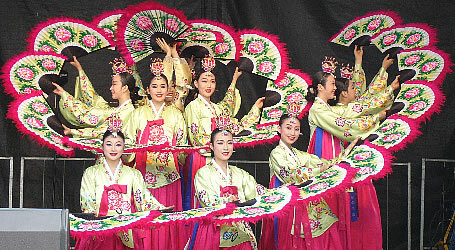 As those figures show, fast-fashion has marked a huge presence in Korea’s fashion market. Experts say their rise was backed by offering greater variety quickly to customers at a reasonable cost in the fast-spinning wheel of fashion. Stores of such fast-fashion brands, or SPAS have packed Seoul’s shopping districts such as Myeong-dong or Hongdae. When asked “Where do you buy your jeans?” eight out of 10 college students interviewed said they usually visit fast-fashion retailers for shopping. “I’m a big fan of fast-fashion brands because they offer various products at reasonable prices. The jeans that I’m wearing now are from Uniqlo and the shirt is from Zara,” said Yoo In-seok. Park Hyun-min echoed Yoo’s view. He said, “The biggest strength that such SPAs have is the price of their products. There is nowhere you can buy this number of garments on a limited budget,” showing two T-shirts, two pairs of pants and some underwear he bought from SPAO, a domestic SPA brand here. Park Soo-jin picked more fashion-related reasons for her preference in fast-fashion brands. “Getting away from logo-centric clothes is one of the reasons I choose fast-fashion brands. Just a few years ago, wearing clothes with a big logo on them was considered to be fashionable, but now that is out-dated,” said Park. “Young people these days are looking for basic items or seeking unique designs. Fast-fashion brands are popular because they succeed in meeting such customer expectations,” said Park. Uniqlo, a Japanese SPA brand leading Korea’s fast-fashion market, focuses on offering various basic items in different materials. Its trademark technologies ― “Heattech” for winter and “AIRism” for summer ― enjoy huge popularity for their function in keeping wearers warm or cool. Zara is usually described as the brand most definitive of fast-fashion. The Spanish fast-fashion giant distributes an average of two new designs a week to some 1,700 branches around the world. According to a manager at the company, around 80 designers release new clothing constantly and the company restocks branch shelves with new clothes every week. Customers may not be able to buy shirts they eyed a week ago. As its product cycle spins more quickly than other brands, its products are said to be the most “trendy” and “fancy,” reflecting young people’s fashion choices. H&M, the global fast-fashion “king” from Sweden, falls in between the two rivals. It sells basic goods and offers trendy items at the same time. It also releases many collaboration pieces from renowned luxury brand designers, offering a glimpse of pricy designer goods to budget-strapped customers. The company entered the Korean market later than its rivals, but said it has 16 stores in the country and is expanding its business operations. Amid the sluggish economy, SPA fashion retailers have been showing a strong performance in Korea, as well as in other countries. The fashion retail conglomerates say they sell cheap and trendy fashion clothes for customers. There has been a dispute over quality and price as SPA firms insist that while products may be cheap, all products maintain the same standard of quality. There may be benefits for customers in buying clothes priced so reasonably. However, whether the quality of the product matches the price is another issue. “Considering the quality of the clothes, I think the price is not reasonable at all. I bought a pair of jeans in one SPA store in Korea that stretched out after wearing them few times,” an office employee working near Seoul Station said. “The products look fine at first glance, but when you take a closer look, you can see the sewing is incomplete or not carefully done,” a university student surnamed Koo said. Uniqlo recently released its fall-winter product lines in cashmere and silk, which sell from 50,000 won. Zara sells products at relatively expensive prices, especially in men’s clothes, according to a fashion blogger in Naver, who has been comparing the prices of Zara products over the years. “Clothes are overpriced compared to those in other countries. I bought a set of six socks for 990 yen (10,900 won) in Uniqlo in Beppu in Japan. But I bought four socks in Uniqlo for 15,900 won in Korea. SPA firms likely think of Korean customers as easy-money,” an office worker surnamed Park said. In terms of corporate social responsibility (CSR), Uniqlo has been active in such activities since 2011, but Zara, which posted some 200 billion won in sales in 2012 in Korea, has never engaged in such activities during the four years the firm has been in Korea. “I barely see SPA companies performing CSR activities in Korea, even though they make a lot of money here. Looking at that, I just assume that they only just want to earn money,” a consumer said. A garment factory in Bangladesh collapsed on April 24, killing more than 1,000 local people who worked inside the building. The rise in the demand for cheap clothing overseas has led to cuts in production costs. The factory where the workers worked was shabbily built, leading to the accident, and the wages they received were deemed to be the cheapest among Asian countries. This naturally came at the expense of the workers’ health and safety, all in order to win a bid from overseas SPAs amid fiercer competition. The disaster in Bangladesh is a prominent case highlighted in the media. However, the sufferers remain victims of the SPA manufacturing system. “Most of our clothes are made in China, India and Southeast Asian countries such as Vietnam and Sri Lanka. The factory which provides the cheapest labor wins our bid. Most SPA firms outsource production, not directly manufacturing,” said a manager at one of the Korean SPA firms by telephone. “With globalization has come consumer apathy. Who cares about people who make clothing? As long as it is cheap we will buy it,” Anna McMullen, a reporter at CNN, said in a recent article. “Customers would think that the cheap cost would inevitably come at a sacrifice,” a fashion-related office worker said.